Sixteen graduate students participated in this Spring 2014 Studio through the Bloustein School of Planning and Public Policy to develop a conceptual design for restoration of degraded wetlands in a working waterfront along the Raritan River on the Woodbridge/Edison townships line. 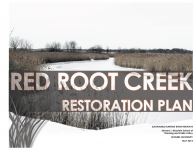 The Red Root Creek Wetlands is held in private ownership by the Federal Business Center in the Raritan Center. This course is the first in a new collaboration between Bloustein and Duke Farms that will promote connections that support Bloustein classes and research in the areas of environmental planning, habitat preservation, green design and stewardship.